Using C'YaPass is extremely easy. It's far easier than memorizing and making up your own passwords. However, it may feel difficult at first because it's a change to the way you do things. The challenge in front of me, as the author of C'YaPass, is to get people to change the way they've been working with their passwords for years. It's not easy and I get it. I understand that change is intrusive. Yes, if you use C'YaPass to generate a password for one of your current accounts it means you'll have to change your password on that account. That's actually the entire point of C'YaPass. The point is to allow C'YaPass to generate strong passwords for your accounts. 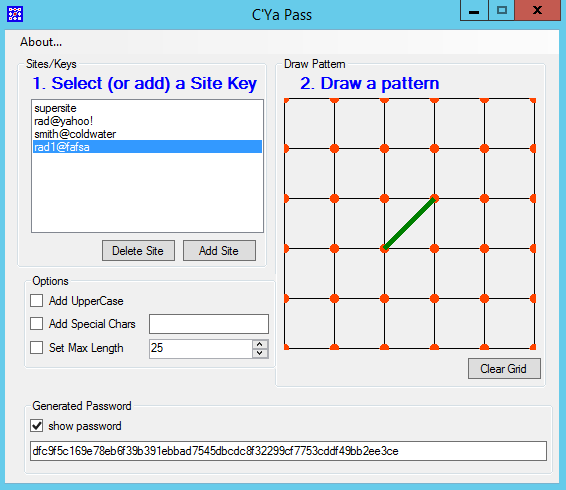 As I've mentioned before, the easiest way to begin using C'YaPass is to ease into it by trying it for one account. So, maybe you're a long time password user and you are resistant. That's fine. I understand. But think about who can really benefit from using C'YaPass. Who Stands to Benefit the Most From C'YaPass? For those users who haven't been typing passwords for five, ten or twenty years, C'YaPass is going to seem obvious. Imagine a new computer user (probably a child of eight or ten years) who is forced to make up a password. Do you think that child is going to know how to create a strong password? Probably not. Introduce the child to C'YaPass now, before she learns all the bad habits of creating and managing passwords that most of us have learned. It really makes sense. There is an advantage to you also. With C'YaPass you can more easily manage all of your child's passwords in one place making it much easier to log into your child's accounts when necessary. 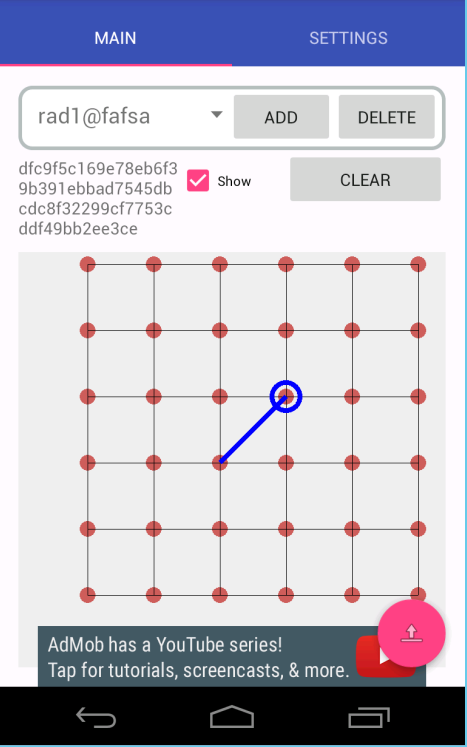 *note: In the Android, iOS, and Windows app the copy is automatically done for you. However, there are limitations on the browser to do this easily. The browser version is just to provide you with an easy way to try the app. Now you can get the app for all your devices for free. Now you can try C'YaPass in your web browser before you download the iPhone/iPad, Android and Windows versions. Any site/keys that you add are only stored locally within your browser's localStorage. The password is generated in your browser client and never transferred across the Internet. This is a client-side app so you do not have to worry about your site/keys being stolen. However, LocalStorage is browser and site specific. That means you cannot get to these site keys from any other browser you may use. For example, if you add keys to Chrome then you'll always have to use Chrome to get to those again. If you happen to open the page in Microsoft Edge later, you will see that the site/keys are empty. You can add them to Edge manually, of course. LocalStorage is also tied to the base URL also and this helps protect your data from being read by other web sites. Once you've tried it in your browser you will surely want to get the Mobile app for all your phones and devices. Here's where you can get the iPhone/iPad, Android and Windows versions. It's that time of the year again when magazines start rolling out their predictions of the future. Although these articles sometimes get things right, they are more often incorrect when we look back and reflect upon their predictions. Often, when they are wrong it is because the prediction ignores some basic knowledge of the human condition. For example, humans like to eat tasty foods and flavor drives appetite. 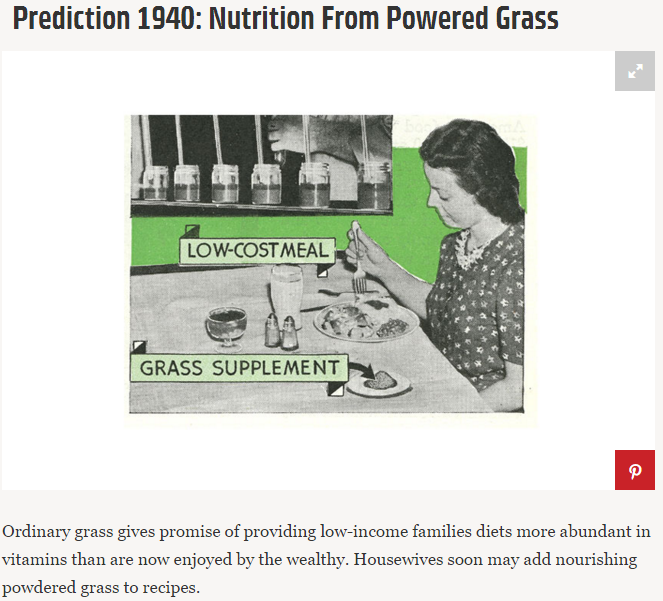 However, a lot of predictions from the past centered around future people eating "nourishing meals" that contain scientifically formulated sustenance. Here's a good example of one of those types of additives that never quite took off. Here's another one that seems to forget the basic human condition. That is very possibly a far better idea than driving around in cars. However, most people aren't going to submit to be stuck into a cramped little tube and shot around the city. A large number of people are claustrophobic and wouldn't go anywhere near these. But, even for people who don't have claustrophobia, the possibility of getting stuck in the tube sounds quite awful. Technology fails when it forgets the human condition. 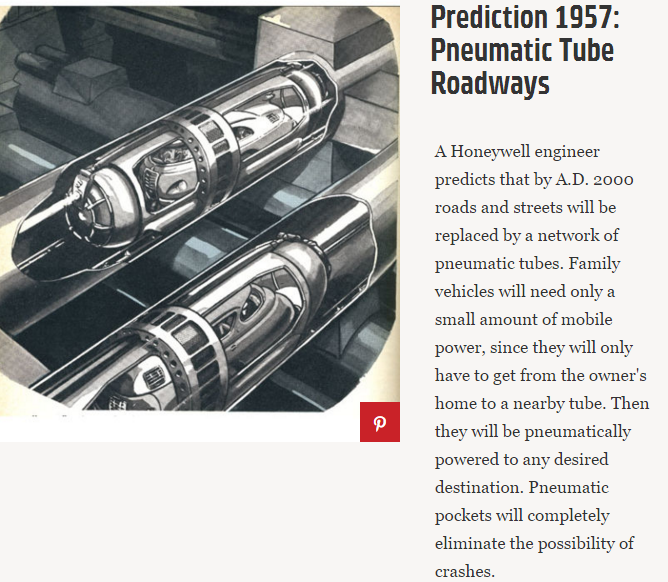 You can see many more of the predictions (clothing made from asbestos, personal helicoptiers, accurate weather prediction and more) in the Popular Mechanics article^. If software is so inhuman that using it is an exercise of complete frustration people won't use it. That's why I created C'YaPass. To make it far easier to make all your passwords strong. If you'll try it, I believe you'll find it is actually easier than storing them in a notebook or making up passwords of your own. Of course, C'YaPass is free for your use and you can get it for iPhone/iPad, Android and Windows. If you decide to try C'YaPass, you do not have to immediately migrate all of your accounts to use the app. You do not have to use C'YaPass for every account that you use. Instead, you can try it with one password and see if it makes things easier for you. Once you no longer have to type that password I'm sure you'll be convinced, as I have, that using C'YaPass is far easier than memorizing and typing all those passwords you have to deal with. Keep in mind that your password is never stored anywhere. Not on your device, not in the app and not in The Cloud either. 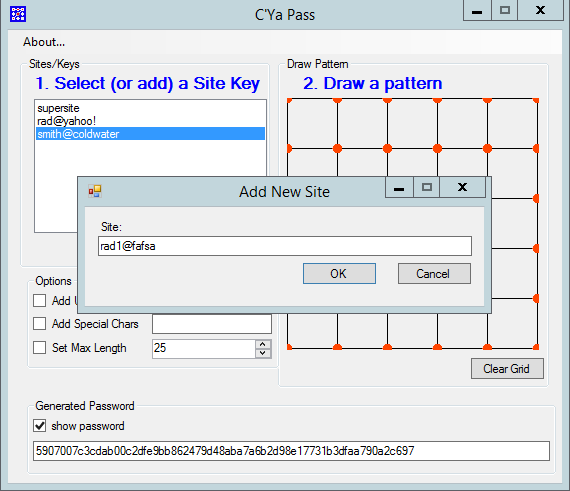 Instead, with C'YaPass your password is always generated. You can read more about that on this site. Maybe you have one particular site that you log into to numerous times a day. Maybe you decide you'd rather type that one each time. With C'YaPass you can do that. You can allow C'YaPass to manage any number of your accounts : you can try it with one, a few, many or all of them. All you need is the application available to you one each of your devices. Of course, C'YaPass is free on all three major platforms (Windows, iOS, Android). If you have multiple devices, that's okay too, just download the free app for each of your devices. I have it installed on my laptop (my main computer), my Kindle Fire, my Samsung (Android phone) and my iPad Mini 3. Here are the links so you can easily get the software. You don't have to write your passwords down any more. There's a better way now. Watch the included video to see C'YaPass in action. Are Sticky Notes For Real? I recently went into a coworker's cubicle to give him a printed document he had requested a signature on. He wasn't there so I slid it under the keyboard. When I did, it only went so far so I picked up the keyboard and noticed a sticky note was jammed under there. Oh no! Do People Really Use Password Notebooks? The following amazon product link (opens in a new tab/window) shows you where you can buy the password log book. The product has been selling like hot-cakes since 2010. Obviously, many people employ their own generic notebooks also. These notebooks make sense. They especially make sense for home-users -- people who have a large number of IDs / passwords to deal with related to bills and all the rest. They also make great sense for an anyone whose memory may not be as good as it was in the past. However, these notebooks can be a problem too, if you have family members or others coming into the elderly person's house who might not be as trusted as you hope. Bad stuff happens sometimes. Unfortunately people get curious and may decide they want to know grandpa's banking password. I spoke with a number of people who have to manage large number of passwords at work and they said they use a master spreadsheet which they keep encrypted on their computer or a server on the network. C'YaPass makes it so you never have to use any of those methods again. C'YaPass will add an extra layer to keep your passwords out of the hands of physical intruders too. I understand the software is new to you so you definitely want to see it in action before you try it. The following video will show you the Windows version being used and then switch over and show you how you would then use the iPhone version to generate your password when you are mobile. Are You Still Making Up Passwords? The requirement to make up a new password often breaks the natural workflow. It happens in a 100 different ways, but it happens often. Now you have to stop, create a new ID and then think up a new password. Then, after you create the new ID and password you have to make sure you record it somewhere because you are not going to remember it the next time you need it. Where do you record it? In a notebook? That's not great. Get the free C'YAPass (for Windows on this site^) and/or Android (Google Play store link^) and coming soon to iOS in the app store. 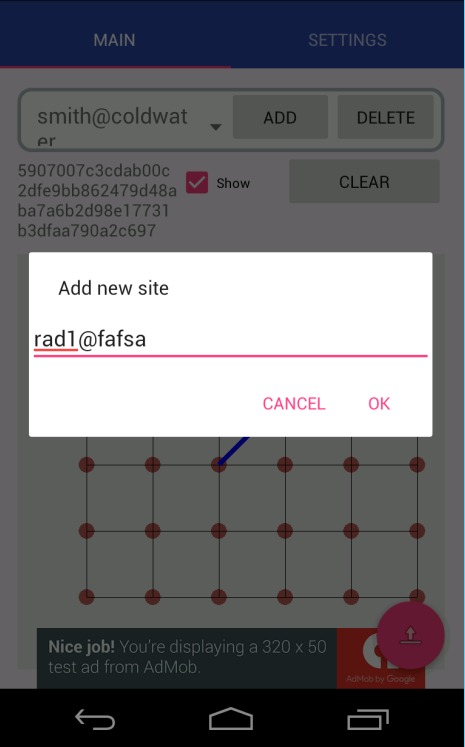 Once you get the app, you'll simply add some site/keys which will help you remember which site the generated password is associated with. Here's a snapshot of the Windows app with a few site/keys already created. Now imagine you have the same situation where you are required to create a new password with a new ID at some site. With C'YaPass it is so much easier. 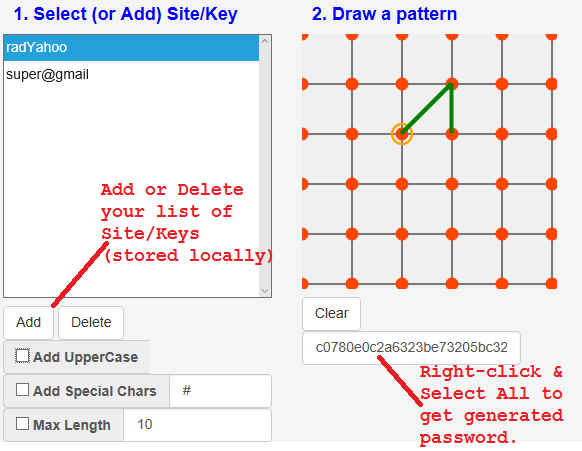 You don't have to do anything except create a new site/key. 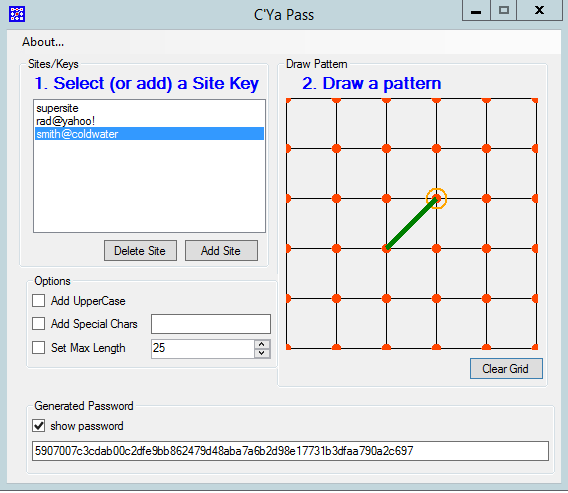 Once you add the new site/key C'YaPass will automatically choose it as the current one and generate your new password from the site/key and your drawing. Notice that the password is different from the previous one. Here's what it looks like in the Android app. When the user clicks [OK] the new site/key is added. It's that easy. The password is copied the the clipboard on Android also so you can simply paste it wherever you're going to use it. 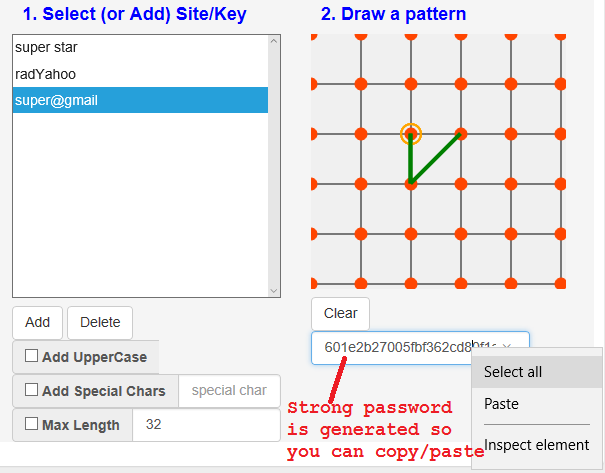 Your password is generated from your stie/key and your drawing. Since they are both the same on both Andriod and Windows, we get the same strong password. You can read more about the details of how C'YaPass does this magic here in other blog entries. Get the app and try it today and start making your life easier with stronger passwords.